Hi, I was wondering if there was a way I could make an album/gallery of photos on disroot, and then share it, e.g., by giving people a link to it. This came up after (once again) someone put a photo of me on facebook (without asking me first). Since disroot doesn't tag me or do face recognition, I thought it would be nice to be able to share photos. Thanks. Yes it is. You can just share any directory (or file) with a public link option. 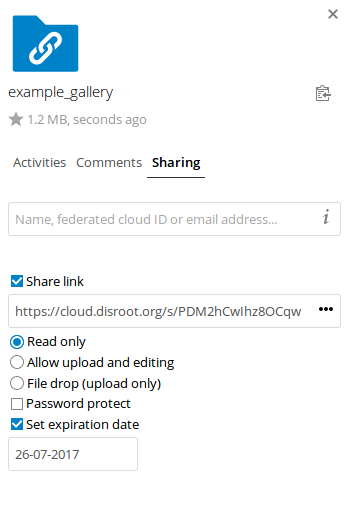 Anyone who knows the url generated by nexcloud can see the content of shared folder. Basically adding the "apps/gallery" into the share url will automatically change it to gallery look. Is there a way to create an album / folder within the gallery? I couldn't find a way to do this. I want to share some photos, but not all, if you see what I mean. OK, silly me, I've gotten over the first hurdle and created a photo gallery in a new folder. Next problem - I see no 'share link' box. I only see the activities / comments / sharing options, clicking on sharing gives me that box with 'Name, federated...', and nothing below. Any suggestions? Thanks.